Today, I’m talking about some Pros and Cons of having a free vs. your very own domain name when running a blog. This is not a full list, though it may give you a rough idea. These are well and good, and they may give you a slight ranking nudge at the beginning. However, you usually do get a very long URL which can make it difficult for people to remember your address properly. Secondly, you do not own that domain name. The reasons that people choose these services is because most of them are free and very easy to set up. All you need to do is fill out an automated setup form and you’re good to go. On the other hand, too many people are put off by the idea of using their own domain name, yet this is actually surprisingly easy, bringing more rewards long-term. The only “disadvantages” of using your own domain name is that you will have to pay a very small fee for registration and hosting, and the set up process may mean a slight learning curve. Still, when building an Internet business, owning your own domain is a prerequisite. Signing up to your own hosting account will give you much more flexibility over what you can do with your blog, and it will make your site and your Internet business much more professional. You can install many of the popular pieces of blogging software on your own server for free. The most popular being WordPress. Search the Internet and you will probably be able to find blog hosting for a mere $6,95/mo. If your hosting provider uses Cpanel then you can install WordPress very easily with a mouse click through Fantastico. Simply go to: http://www.yourname.com/cpanel, log in and then use Fantastico to install WordPress. Otherwise, WordPress can be downloaded from wordpress.org and installed following the instructions there. Although having your own domain name does involve slightly more work and cost a few bucks, it’s definitely worth the extra effort. Giving someone the address mysite.com is much easier to remember than saying things like myowndomainname.blogspot.com. There are a lot more advantages to using your own domain name though. Great piece for beginners, I fell into that entire dilemma when I put up a wordpress free blog..and had to transfer it over after it grew to big. Loosing a PR4 blog and many many links! So true. The advantages of having your own domain name are huge. While the coast isn’t much, the rewards are great. Hosting can be as little as a few US dollars a month. I know always think twice about commenting on a blog that is hosted on blogger. While I’ve noticed more and more people are setting up their blogger accounts to allow Open ID or a name and URL, so many of them still require you do have a blogger ID and only link to a profile. That usually prevents me from commenting. So if one feels they really do want to stay at one of the free websites I recommend, at the very least, that people optimize it for easy commenting. this is so true! there are plenty of great domain names out there. plus, most of the free hosted site have ads. you, the blog publisher, make NO MONEY from these ads. yet your readers are subjected to them. 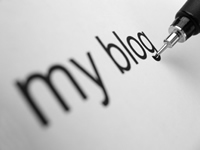 with your own hosted blog, however, you can eliminate ads OR have them and MAKE MONEY! I believe in “best of both worlds”. OK, I do have my own domain name and hosting. I use blogger for my blog but would love to use my own domain name. I just can’t figure it out! How does my blog post get to my domain? Is there a tutorial somewhere? Also, I would like to mention http://www.agilityhoster.com/ They offer a nice package of domain registration and hosting.. It is costing me $17.95 a year. I have been very happy with them so far. Not a lot of down time and very quick service. Just thought I would share that for those who would like to make the change. I have nothing to do with them other than using their service but if you don’t want this in your comments, I understand. I’m beginning to really realize the potential of hosting your own site and having your own domain. I’ve had several suggestions but no definitive way of how-tos and guides. It’ll be nice if you can somehow make a post or link to your post something to that context. Thanks and have a wonderful day. I set up my own domain for both my web novels, rather than trying one of the free blog domains because I wanted to control every aspect of how things looked and what I said. I did this by installing WordPress to the domains through HostMonster. I don’t have to worry about TOS issues because it is my domain. This puts the absolute freedom and absolute responsibility of content choice squarely where it belongs — in the hands of the author. Also, it is far less likely that somebody will steal your domain name if you set up from start. I learned that lesson with Dark matters. I had originally created a subdomain in my own host site, even though the main domain was open, I was still testing the waters. By the time I had gone to buy the domain name, somebody else had bought it. I had to adapt the name a little bit to make it work, rather than fight with the shark for the domain name I had originally intended. So I guess I say, pay for your own domain and hosting service, and buy your domain the minute you have the idea, so it doesn’t get taken by some shark out to rake you for cash. I totally agree in a self hosted, own domain is your best bet. You have full control and not to mention use of WordPress Plug-ins. The downside is maintaining your domain and host account as well as WP updates and plug-in updates. It really is easy, but requires a little effort on your part. The step after your own domain is your own dedicated server rather than a shared one. It’s a nice step and puts basically everything in your control. The technical knowledge requirement increases, though. Right, Leisa, I’m also annoyed when I can only post a comment when entering my blogger ID; does not happen in my case. Renee, I used that technique when launching my first site. It helped me getting my pages listed in a matter of hours. For THAT it is helpful, I agree. Just not as a stand alone when building a serious and profitable Internet business. And to Susie & Rene, the most effective method to do that is implementing a 301 permanent redirect. That way, you won’t lose any links and your PR shall be transferred to the new location. And Stephan, as a matter of fact, I did rent a dedicated server the other year (was in Germany). As an expert told me, it was a very good one and all was well and sound. Though, the learning curve was just too big that time and I hadn’t had money to hire an admin. Will definitely look into this in the future again though since, as you said, it’s a next step. I’ve always adviced newbies to get their own domains. However, having said that, you can succeed with free blogspot or wordpress blogs as well. Case in point, take a look at PostSecret. That’s a PR6 blog hosted on Blogger! I’m so glad I didn’t know how much I was going to have to study and research the technological necessities, on top of the whole internet marketing arena. I’m with Leisa when it comes to commenting on Blogger blogs. I see a very well done blog and I hit the comment button and I’m taken to the blogger comments section. I tried commenting using my OpenID once and something didn’t work correct so it was a total waste of time. I always go with my own domain when setting up a blog, it’s not that expensive and saves time in the long run. My host has an extremely simple way of setting up a WP blog, the worst thing about this is I have to upgrade right away because they are not always up to date. No big deal, just a little inconvenience. I recently bought my own domain, installed WP on it via Fantistico, moved my blog from Blogger to WP to my domain. I’ve had to start all over with technorati rating, real rank, alexa, etc…but I’m not sorry I moved. My problem is that I don’t understand how or what I can do with my domain other than my blog which wound up in the root directory. Have you done a tutorial on this subject? If so, could you please point me to it? Cynthia, when you “moved” your blog from blogger.com to your own domain, did you install a so called “301 permanent redirect” at your blogger.com blog in order to tell the Search Engines that your blog moved? Because that way you normally would NOT loose that much and would NOT have to start from scratch again. My guess says no though. @ Hock, Yes there ARE advantages when using a free blog, especially at blogger.com. One of them is Google crawls and lists your pages often within a couple hours, and sometimes they are highly ranked at Google. Still, when building a thriving Internet business I strongly encourage folks to use an own domain name. The image one portrays on (or to?) others is a more professional one, in my humble opinion.